On Board or Onboard – What’s the Difference? Home » On Board or Onboard – What’s the Difference? When you are safely aboard a vessel, like a cruise ship, are you onboard or on board? What about when you agree with someone’s inspiring plan to save the world? Are you onboard or on board? Actually, the answer to both of those questions is the same. On board and onboard have distinct usage cases, and both of those examples just happened to be situations where on board is correct. Confused yet? Don’t worry—I’ll explain it all below. What is the Difference Between On Board and Onboard? 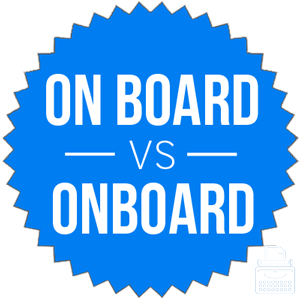 In this post, I will compare on board vs. onboard. I will use each term in at least one example sentence, so you can see them in context. Plus, I will show you a helpful memory tool that will make choosing on board or onboard a little easier. What does on board mean? On board can be a prepositional phrase, or it can function as an adverb in sentences. On board means present, in agreement, or in its most literal sense, safely in a ship. While on board the aircraft, please refrain from smoking cigarettes. Kevin often gets seasick while on board seafaring vessels. On board has a synonym, aboard, which can be a more fluid choice in some instances. It means the same thing, but is shorter and simpler. What does onboard mean? Onboard can be an adjective or a verb. As an adjective, onboard means attached or integral, especially when referring to a vehicle’s equipment. An onboard computer, for instance, is a computer that is built into the design of a vessel. Ashlynn bought a new car, and she was careful to choose one with onboard GPS to help her navigate. The onboard navigational system helped pilots choose the fastest route without wasting fuel. As an adjective, onboard always comes before the noun it modifies—in the sentences above, these are GPS and system. After a verb, choose the phrase on board instead. Onboard can also be a verb, where it is HR-speak for hiring and training new employees. It is usually conjugated as the present participle onboarding in phrases like the onboarding process. The company-wide transition to an online application tool will significantly streamline the onboarding process. The new onboarding process replaces meaningful, one-on-one mentoring by experienced coworkers with an extensive library of outdated, poorly produced training videos. Onboarding or On boarding? If you are part of a team that gets new employees acquainted with their roles in the company, the term you are looking for is onboarding. In this sense, onboard can be a noun or a verb. Is onboard hyphenated? Occasionally, you might see the one-word onboard spelled as a hyphenated compound: on-board. In fact, some spellchecks flag onboard as an error in favor of on-board. Depending on your company’s style guide, you may or may not be required to use the on-board over onboard. The general trend, however, appears to be favoring the closed compound. Now, let’s go over a trick to remember onboard vs. on board. Use onboard as an adjective before the noun it modifies. The phrase on board is an adverb or a prepositional phrase, and it usually goes after a verb. Since onboard is a single two-syllable word, like before, I predict you will experience only minimal difficulty remembering to use onboard before nouns. Is it onboard or on board? These usages contain all the same letters, but they should be kept separate. Onboard is an adjective that means attached, and a verb that means to acclimate new hires to a new company. On board is an adverb or prepositional phrase that means safely aboard a vessel or in agreement. 1 What is the Difference Between On Board and Onboard?